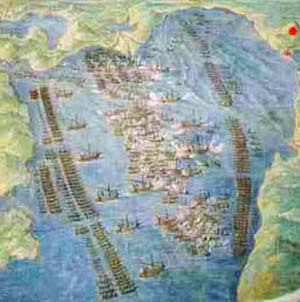 The Battle of Lepanto was a naval engagement taking place on 7 October 1571 when a fleet of the Holy League, of which the Venetian Empire and the Spanish Empire were the main powers, inflicted a major defeat on the fleet of the Ottoman Empire in the Gulf of Patras, where the Ottoman forces sailing westwards from their naval station in Lepanto (the Venetian name of ancient Naupactus Ναύπακτος, Ottoman İnebahtı) met the fleet of the Holy League sailing east from Messina, Sicily. The Holy League was a coalition of European Catholic maritime states arranged by Pope Pius V and led by admiral John of Austria, as agreed between Philip II of Spain, who largely financed the League, and the Venetian Republic (main contributor of ships). 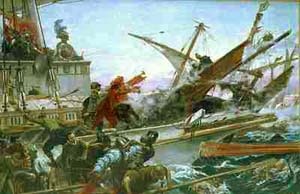 In the history of naval warfare, Lepanto marks the last major engagement in the Western world to be fought entirely or almost entirely between rowing vessels, the galleys and galeasses that were still the direct descendants of the ancient trireme warships. The battle was in essence an "infantry battle on floating platforms". 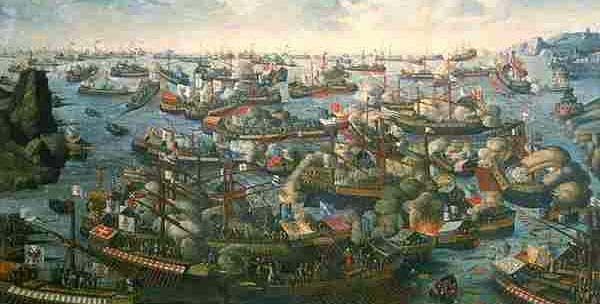 It was the largest naval battle in Western history since classical antiquity, involving more than 400 warships. Over the following decades, the increasing importance of the galleon and the line of battle tactic would displace the galley as the major warship of its era, marking the beginning of the "Age of Sail". The victory of the Holy League is of great importance in the history of Europe and of the Ottoman Empire, marking the turning-point of Ottoman military expansion into the Mediterranean, although the Ottoman wars in Europe would continue for another century. It has long been compared to the Battle of Salamis both for tactical parallels and for its crucial importance in the defense of Europe against imperial expansion. It was also of great symbolic importance in a period when Europe was torn by its own wars of religion following the Protestant Reformation, strengthening the position of Philip II of Spain as the "Most Catholic King" and defender of Christendom against Muslim incursion, although this was mitigated by the defeat of the Spanish Armada by the Royal Navy of England in 1588. The members of the Holy League were the Republic of Venice, the Spanish Empire (including the Kingdom of Naples, the Kingdoms of Sicily and Sardinia as part of the Spanish possessions), the Papal States, the Republic of Genoa, the Duchies of Savoy, Urbino and Tuscany, the Knights Hospitaller and others. 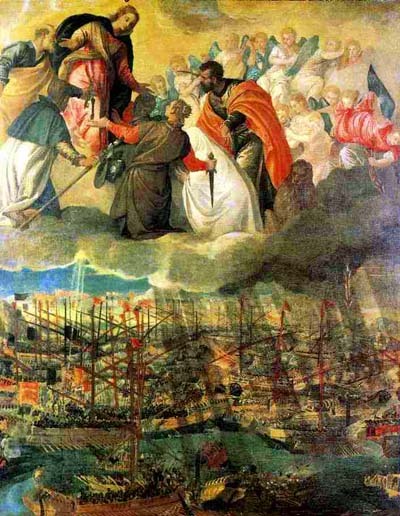 The banner for the fleet, blessed by the Pope, reached the Kingdom of Naples (then ruled by the King of Spain) on 14 August 1571. There, in the Basilica of Santa Chiara, it was solemnly consigned to John of Austria, who had been named leader of the coalition after long discussions among the allies. The fleet moved to Sicily and, leaving Messina, reached (after several stops) the port of Viscardo in Cephalonia, where news arrived of the fall of Famagusta and of the torture inflicted by the Turks on the Venetian commander of the fortress, Marco Antonio Bragadin. All members of the alliance viewed the Ottoman navy as a significant threat, both to the security of maritime trade in the Mediterranean Sea and to the security of continental Europe itself. Spain was the largest financial contributor, though the Spaniards preferred to preserve most of their galleys for Spain's own wars against the nearby sultanates of the Barbary Coast rather than expend its naval strength for the benefit of Venice. 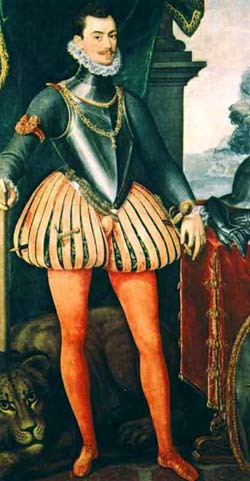 The combined Christian fleet was placed under the command of John of Austria (Don Juan de Austria) with Marcantonio Colonna as his principal deputy. The various Christian contingents met the main force, that of Venice (under Sebastiano Venier, later Doge of Venice), in July and August 1571 at Messina, Sicily. John of Austria arrived on 23 August. 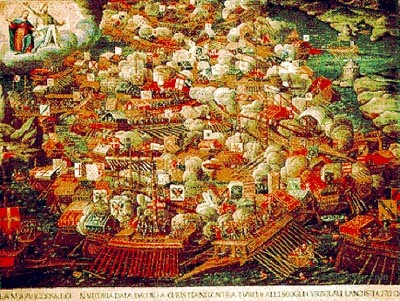 The Christian fleet consisted of 206 galleys and six galleasses (large new galleys, developed by the Venetians, that carried substantial artillery) and was commanded by Spanish Adm. Don John of Austria, the illegitimate son of the Holy Roman Emperor Charles I of Spain and V of the Holy Roman Empire, and half-brother of Philip II of Spain, supported by the Spanish commanders Don Luis de Requesens and Don Álvaro de Bazán, and Genoan commander Gianandrea Doria. The Republic of Venice contributed 109 galleys and six galleasses, 49 galleys came from the Spanish Empire (including 26 from the Kingdom of Naples, the Kingdom of Sicily and other Italian territories), 27 galleys of the Genoese fleet, seven galleys from the Papal States, five galleys from the Order of Saint Stephen and the Grand Duchy of Tuscany, three galleys each from the Duchy of Savoy and the Knights of Malta and some privately owned galleys in Spanish service. This fleet of the Christian alliance was manned by 40,000 sailors and oarsmen. In addition, it carried approximately 20,000 fighting troops: 7,000 Spanish regular infantry of excellent quality, 7,000 Germans and Croats, 6,000 Italian mercenaries in Spanish pay, all good troops, in addition to 5,000 professional Venetian soldiers. Also, Venetian oarsmen were mainly free citizens and able to bear arms, adding to the fighting power of their ship, whereas convicts were used to row many of the galleys in other Holy League squadrons. Free oarsmen were generally acknowledged to be superior, but were gradually replaced in all galley fleets (including those of Venice from 1549) during the 16th century by cheaper slaves, convicts and prisoners-of-war owing to rapidly rising costs. Ali Pasha, the Ottoman admiral (Kapudan-i Derya), supported by the corsairs Mehmed Siroco (natively Mehmed Şuluk) of Alexandria and Uluç Ali, commanded an Ottoman force of 222 war galleys, 56 galliots and some smaller vessels. The Turks had skilled and experienced crews of sailors but were significantly deficient in their elite corps of Janissaries. The number of oarsmen was about 37,000, virtually all of them slaves, many of them Christians who had been captured in previous conquests and engagements. The Ottoman galleys were manned by 13,000 experienced sailors--generally drawn from the maritime nations of the Ottoman Empire--mainly Berbers, Greeks, Syrians and Egyptians--and 34,000 soldiers. The Christian fleet started from Messina on 16 September, crossing the Adriatic and creeping along the coast, arriving at the group of rocky islets lying just north of the opening of the Gulf of Corinth on 6 October. Serious conflict had broken out between Venetian and Spanish soldiers, and Venier enraged Don Juan by hanging a Spanish soldier for impudence.Despite bad weather, the Christian ships sailed south and, on 6 October, reached the port of Sami, Cephalonia (then also called Val d'Alessandria), where they remained for a while. Venetian flagship, Paolo Giordano I Orsini and Pietro Giustiniani, prior of Messina, commanding the flagship of the Knights of Malta. Two galleasses, which had side-mounted cannon, were positioned in front of each main division for the purpose, according to Miguel de Cervantes (who served on the galley Marquesa during the battle), of preventing the Turks from sneaking in small boats and sapping, sabotaging or boarding the Christian vessels. This reserve division consisted of 38 galleys--30 behind the Centre Division and four behind each wing. A scouting group was formed, from two Right Wing and six Reserve Division galleys. As the Christian fleet was slowly turning around Point Scropha, Doria's Right Division, at the offshore side, was delayed at the start of the battle and the Right's galleasses did not get into position. The engagement was a significant defeat for the Ottomans, who had not lost a major naval battle since the fifteenth century. The defeat was mourned by them as an act of Divine Will, contemporary chronicles recording that "the Imperial Fleet encountered the fleet of the wretched infidels and the will of God turned another way." However, the Holy League failed to capitalize on the victory, and while the Ottoman defeat has often been cited as the historical turning-point initiating the eventual stagnation of Ottoman territorial expansion, this was by no means an immediate consequence; even though the Christian victory at Lepanto confirmed the de facto division of the Mediterranean, with the eastern half under firm Ottoman control and the western under the Habsburgs and their Italian allies, halting the Ottoman encroachment on Italian territories, the Holy League did not regain any territories that had been lost to the Ottomans prior to Lepanto. A piece of commemorative music composed after the victory is the motet Canticum Moysis (Song of Moses Exodus 15) Pro victoria navali contra Turcas by the Spanish composer based in Rome, Fernando de las Infantas. The other piece of music is Jacobus de Kerle "Cantio octo vocum de sacro foedere contra Turcas" 1572 (Song in Eight Voices on the Holy League Against the Turks), in the opinion of Pettitt (2006) an "exuberantly militaristic" piece celebrating the victory. There were celebrations and festivities with triumphs and pageants at Rome and Venice with Turkish slaves in chains. Black AzraeI and Ariel and Ammon on the wing. And he smiles, but not as Sultans smile, and settles back the blade. . . .